You need systems in place to take a lead, nurture it and then create business from it. Put time on your calendar to get together with your COI once a quarter. Make sure that you have the support, staff and systems in place to handle the business. How much are you spending each month for online leads? Leads are something that every sales person would like to have. 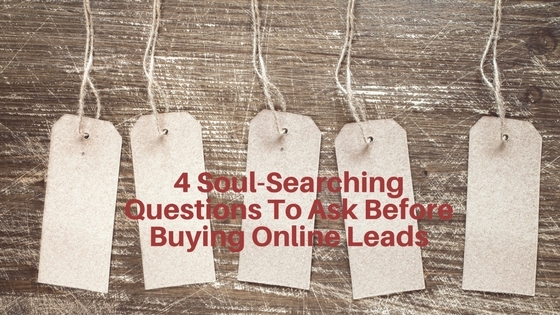 But ask yourself the following questions before spending another dime on online leads. Do you really want leads? I don’t. I have been in sales for 11 years, so our business is probably more established than most. One thing I do always want is more referrals. At a minimum, I would like a qualified lead. Many people think leads are the answers to their business growth. They might be, but more than likely, you really need referrals or systems in place to take a lead, nurture it and then create business from it. Sit down, define your sales cycle and know what a lead, qualified lead and hot lead might be in your business. Wouldn’t you rather have referrals than leads? I would. How many leads would it take you to get one qualified referral? I’ve personally found that investing in a referral-based business is much more profitable, sustainable and enjoyable than a lead or transactional based business. What are some things you can do with your network that already knows, likes and trusts you to generate more business? Check out the article I wrote about three ways to double your referral business for more ideas. Do you have the systems and support to scale your business? Many agents make the mistake of developing new systems and spending money on programs before they have the foundation and business in place to scale. If you do see value in paying for leads or advertising, make sure you will get a minimum of a three-to-one return on your investment. If you want to invest just $1,000 in ads or leads, will your net profit off of those leads be $3,000? If not, it still might be OK to spend the money, but talk to a mentor or coach before doing so. Also, make sure that you have the support, staff and systems in place to handle the business. If things do go well, are you going to get what you want? Maybe you could invest money, and it would turn into more leads than you can handle. Is that what you would really want. Most of the time, I’ve found that people don’t have the systems and support to handle the business that would come from spending that money. Is there a more profitable way to generate the same or more business? Usually there is. Consider taking the time to work your current centers of influence. Put a plan together to develop 20 solid relationships. Just one or two deals a year from those people will bring in way more business than any paid leads or advertising. Put time on your calendar to get together with these people once a quarter. Reach out once a month over the phone. Spend time with them, help them with their goals, and you will notice the business start to come your way. Take the time to get clear on what outcomes you are looking for before making investments into your business. Simon Sinek’s bestseller “Start with Why: How Great Leaders Inspire Everyone to Take Action” is a great read and can help you find your true ‘why’. Get clear on the results you want, set a plan to get there and take massive action.